Two Organs Short: Hooray for the Wiggles!! Before we first used the infusion sites we were told to go home and practice on each other. So we sat down after the boys were in bed and nervously prepared to insert a site. Vicky practised on me, and I practised on....er ....me! It was quite nerve-wracking, for the person on both ends of the needle! It's no little pin-prick: that's a pretty long needle she was wielding. Not a particularly nice experience. So imagine what it must be like for a toddler or baby on the sharp end of the needle. Little or no knowledge of diabetes or why your parents, the two people you most trust in the world, are inflicting this pain on you. In those early weeks and months, when the needle was just about the whole length of his thigh muscle, although it was hard for us to insert the site, feeling just so wrong to be doing that, he at least didn't put up a fight. He barely registered it sometimes. All his fight was on staying alive. His battle was bigger than a stupid needle. But as he grew he started to make his feelings known. He learnt the routine. If both of us appeared at his change mat he knew what was in store for him. One to hold his leg bent to bunch enough muscle to aim the needle at (there was no fat on him, none) and one to wield the needle. We tried to alter the routine to relax him but, though Finlay may be many things, he is not stupid. He always knew when it was time to change the site. And the stronger he got the harder it was getting for us. But salvation came from the Wiggles. They are a four man children's entertainment phenomenon. I don't know how big they are in other parts of the world but if you're a preschooler in New Zealand or Australia these are the guys! A year or two back we were having problems with recurrent skin infections at sites. The solution was to use some antibiotic cream after removing the site and stick a plaster over the cream to stop it going everywhere. It worked. No infection problem now. 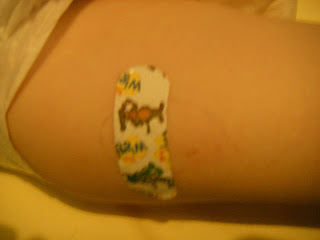 Recently we were scrambling around for a plaster after a site change and came across a Wiggles plaster. We popped it on and Finlay was delighted. Now everytime we get ready for a site change, rather than the usual screams and burying his head in his teddy bear, he just looks at us sternly and enquires "Wiggles?". We show him the new Wiggles plaster and all is right with the world. All it takes is Dorothy the Dinosaur or Wags the dog to be slapped on to his thigh and site changes are a whole new experience.